Established in 1905 Outhwaites ltd has over a century of rope making tradition. Whilst many things have changed during this time, all of our rope is still made by hand in North Yorkshire. From laying the rope to forming knots and splicing all of our products are created by our team of dedicated staff ensuring a level of quality that you'd expect from a British manufacturer. For more information on the rope product you're interested in please follow the buttons below. To watch the rope being made, look left! Click to see our extensive range of individually made dog leads. Both moulded and spliced leads include a variety of lengths, diameters, colours and the choice between trigger hook or slip collar design. Our agricultural ropes include cattle halters, cow ties, plough lines and lead ropes made from cotton, polypropylene or polyester. 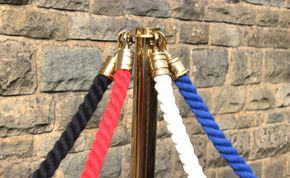 Our barrier rope systems offer both brass and chrome fixtures, uprights and bases. We provide a hook fitting service, however, you can of course buy rope and fixtures separately. Click to see our exclusive bannister ropes. Each rope is tailor made to your staircase, finished with the knots you can see above, and a choice of matt black, chrome and brass brackets.